As our Aikido school maintains its popularity, we continue to make our members aware of the rigid safety policies of our dojo. We practice a potentially dangerous art which has inherent risks. For this reason, it is paramount that we all make practice as safe as possible. Safety is one of the reasons for the strict discipline in every aikido dojo, including ours. Safety is the reason that you must follow Sensei’s instructions exactly and without question, and your actions should not deviate from those instructions. Safety is one of the reasons that we practice cooperatively with each other and offer no resistance. Not only does it aid your learning, but as uke (the person receiving the technique), it is safer to go with the flow during a technique and take ukemi (roll out) safely, than it is to resist. Safety is not just the responsibility of the instructor in charge of the class. Safety is everyone’s responsibility. Once you enter the dojo, you must be aware and stay aware of what is going on around you. You must also accept personal responsibility to play your part in safe practice. One of the principal safety measures in our dojo is embedded in the Aikido Yuishinkai syllabus itself. It is taking Ukemi. The art of ukemi (defensive falling) is not only 50% of the learning required in Aikido, but the way that all aikido students keep themselves safe during practice. To opt out of ukemi (forwards & backwards rolling and breakfalling) for any reason puts you at risk of being injured during practice. Seniors who can’t or won’t learn or implement the art of ukemi put themselves in even more danger because there is an assumption across all dojos that anyone wearing a hakama or a black belt can take ukemi with enough skill not to injure themselves. It is because of safety concerns that we demand strict adherence to instructions given by our instructors. The class instructor is responsible for the activities undertaken by the class; the only one with a lesson plan; and the only one who has an overview of what everyone in the class is doing. By not following requests and instructions to the letter means you could you be placing yourself at risk, as well as endangering others. We have a policy of allowing people to sit out of any activity they choose. However, that does not mean you can learn only part of the art. We expect you to embrace the entire art as taught by Maruyama Sensei. Therefore, you cannot expect to grade to a higher rank if you don’t have all of the necessary skills contained within the art of Aikido Yuishinkai. Even though only some of the open hand techniques, disarming techniques and weapon kata are examined during a grading demonstration, it is also necessary to gain prociency in (amongst other things) ukemi, extending Ki, folding the hakama, leading the warm ups, and leading practice. Practicing Aikido (or not) is always your choice. At any time, you may sit out of an activity. Whether you are injured, feel unwell, or assess that an activity is beyond your present capability, you always have the right to choose. 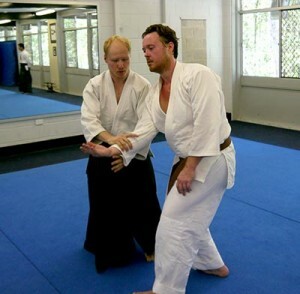 Remember that in learning Aikido you are also learning the traditions and etiquette of Aikido. We therefore ask that you do not refuse to participate in traditional and etiquette-related activities such as bowing, respecting the rank of those senior to you and folding the hakama of an instructor. If you do that (i.e. refuse) as an intermediate or senior, you are setting a very poor example for those coming behind you. One of the most important requirements of long term Aikido training is sustained good health, which includes an injury-free body. It is difficult to practice when you are sick or injured. It can also be unsafe for others. So in addition to observing safe practices on the mat, good health practices, both on and off the mat, are critical to maintaining a safe environment for everyone. One of the first techniques you learn in Aikido is Ukemi – the art of defensive falling. Instruction starts in the Beginner’s Course and Ukemi practice never ceases. It is critical that you develop the ability to be able to fall correctly and safely because it underpins safe Aikido practice. It also plays a significant role in self protection outside the dojo. All injuries must be reported to the class instructor. It is often the case that you don’t realise that you are injured until you go home and cool down. If that is the case, please let us know as soon as possible, even if that is at the next class or by email. We need your feedback to be able to take action. It is your responsibility to tell the instructor of any infectious disease you may have or any condition that might affect the health of others. The most common infectious disease is a cold or flu. We understand your commitment to practice but in the interests of protecting your fellow students please do not come to class when you are sick with a cold, flu or any other infectious disease. The instructor may also ask you for a written medical clearance before allowing you to return to class. We understand that some students are keen to return from injury or illness, but they can also represent a danger to themselves or to their fellow students. When returning from injury or when nursing a minor injury, it is the student’s responsibility to disclose the injury to the instructor and to every training partner. It is our practice to put tape of your Gi in the form of a cross (x) to mark the injured or sensitive body part. If you are bleeding or have blood on you or if you have blood on your Gi then you must leave the mat immediately. This also applies to a cut or an open wound that has the potential to bleed during practice. Most cuts are caused by long fingernails, toenails and items of jewellery worn on the mat. Occasionally, the cause can be accidental collision with another student or accidental contact with a wooden weapon. Any student who has come into contact with blood may not return to the mat until blood has been cleaned off, bleeding has stopped and the wound is appropriately dressed. Any blood affected area of the mat should not be used until cleaned and disinfected with dilute bleach solution (5.25% sodium hypochlorite). Gloves should be used when treating or come into contact with blood. Disinfectant, dressings, gloves and bleach are located in the First Aid kit. If you have come into contact with blood and are concerned, seek further medical advice. Self discipline and self control are two of the cornerstones of Aikido. Like any other martial art, Aikido starts and finishes with respect. These attributes, together with the expectations set out below, form the foundation of safe practice for everyone. Everyone is different when it comes to applying wrist locks and pins. Be aware that many people are inflexible and cannot take much joint pressure. Apply pressure very slowly. Be alert to Uke tapping the mat or tapping them selves. This is your signal to release the pressure immediately. Joint lock pressure should never be applied to anyone under the age of 18 years. Just as cooperative practice is the key to increased skill and competence, cooperation and teamworkgets the mats laid out, vacuumed and rolled up again.